The precursor to the African Union was the Union of African States, formed in 1958, and was formed between Ghana, Guinea, and Mali. The flag itself took the colours of the three nations, arranged as a horizontal tricolour of red, yellow, and green. 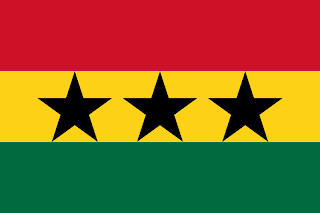 3 black stars where placed along the central yellow stripe, representing the three nations. 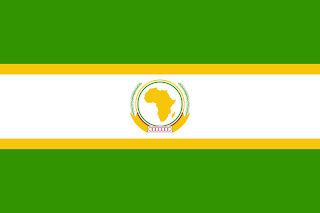 It was followed in 1963, with the Organisation of African Unity. The OAU functioned to promote unity between African states, to help develop the African continent, and eradicate colonialism. Upon independence, many African nations sought greater unity. 2 camps formed, some seeking unity across the continent, all the way up to political unity. Others wanted a looser unity, with nations becoming closer more gradually through economic co-operation. In order to reconcile these, the Emperor of Ethiopia invited everyone to Addis Ababa where the OAU was formed, and subsequently headquartered. The flag of the OAU consisted of 3 horizontal stripes, of green, white, and green. 2 thin yellow stripes separated the green from the white. In the centre was the emblem of the OAU. A map of Africa in gold, within the 2 circles of yellow and green. Surrounding the circle are 2 stylised palm leaves. In 2004, the OAU was formally disbanded, and replaced with the African Union. It was set up to function in a similar manner to the European Union, and deliver economic and political benefits to the people of Africa. The first flag was the flag of the OAU, until January in 2010, when a new flag was instituted. The new flag takes a plain green field, and on it is a star featuring 53 rays, with 53 stars. 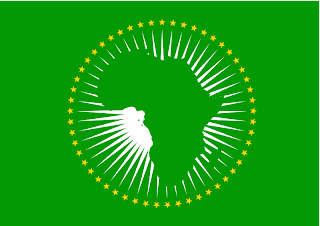 A green silhouette map of Africa is placed over the centre of the star.